With a free Sunday afternoon, most people would just kick back and relax. 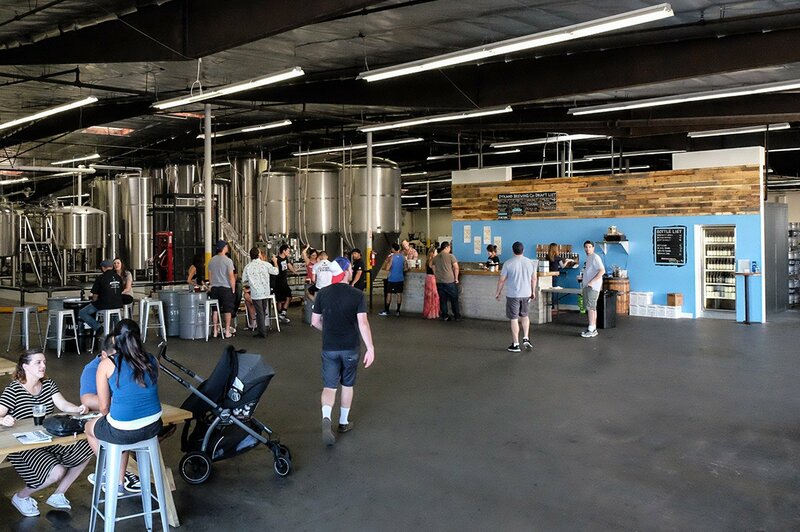 I’m not that much into relaxing, so I took the opportunity to visit five craft beer breweries in Torrance, California that are literally within a mile of each other. 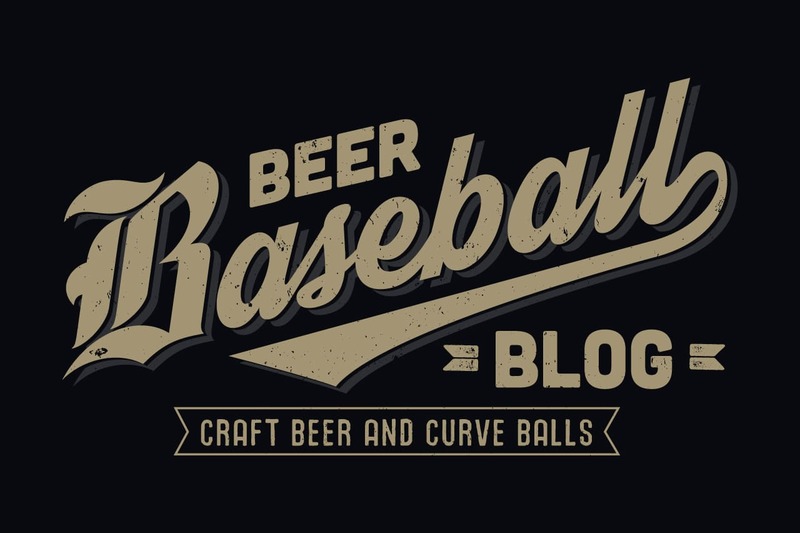 Accompanied by my Beer Baseball Blog correspondent Kevin Lyon, and with expiring Groupons on our phones, we went exploring to Los Angeles for some delicious craft beer. 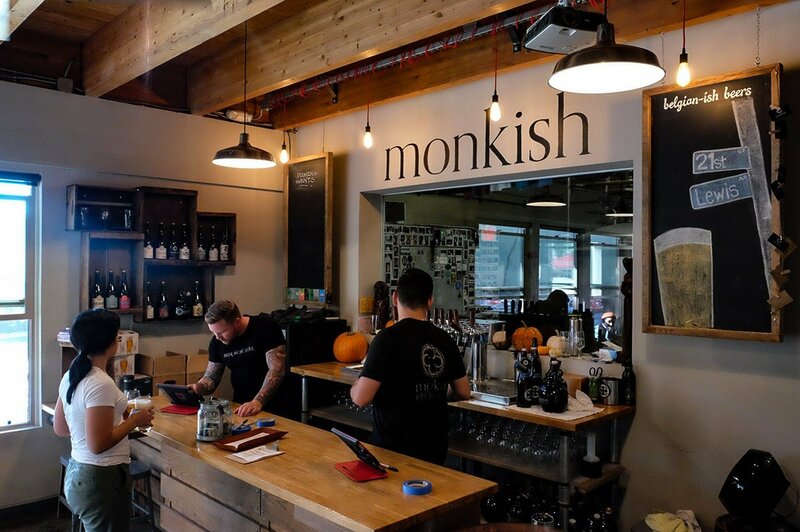 My first visit to Monkish Brewing Company was over a year ago and I was very excited to return. Why? 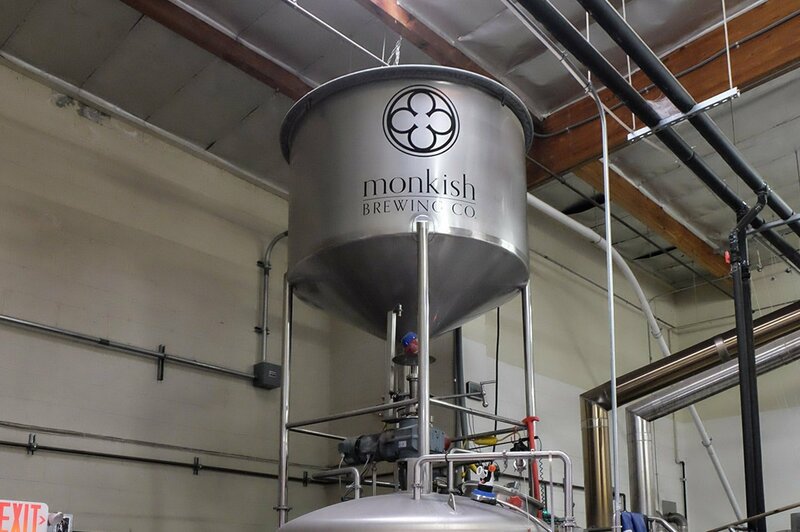 Because one of the best tasting beers I had ever had was from Monkish. It was a Belgian Pale Ale called ‘St. Mosaic’. It was one of those beers that you remember for years because it was THAT good. 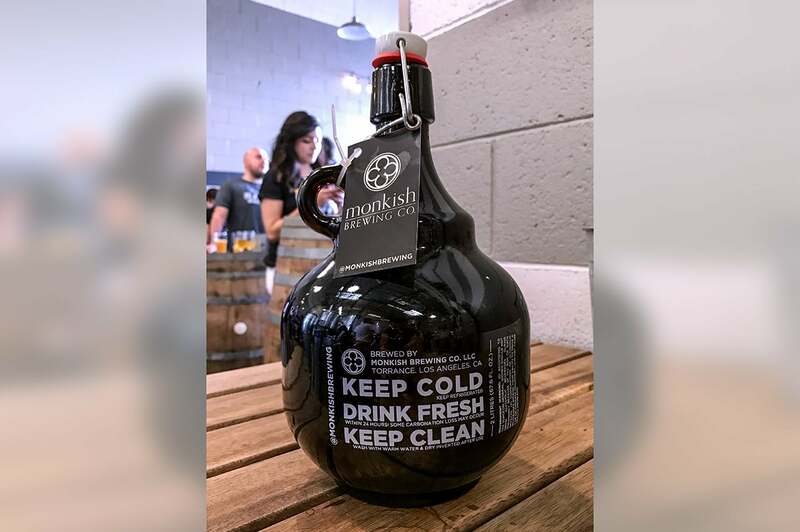 Monkish brews Belgian-ish & IPA-ish beers on-site and has gained a lot of popularity with short-run releases that sell-out very quickly. So quickly, in-fact, that people don’t even get to try some of their releases. With that in mind I opted for the ‘Eric C. Is President’ IPA in a take-home growler. Here is the Untappd description for it. 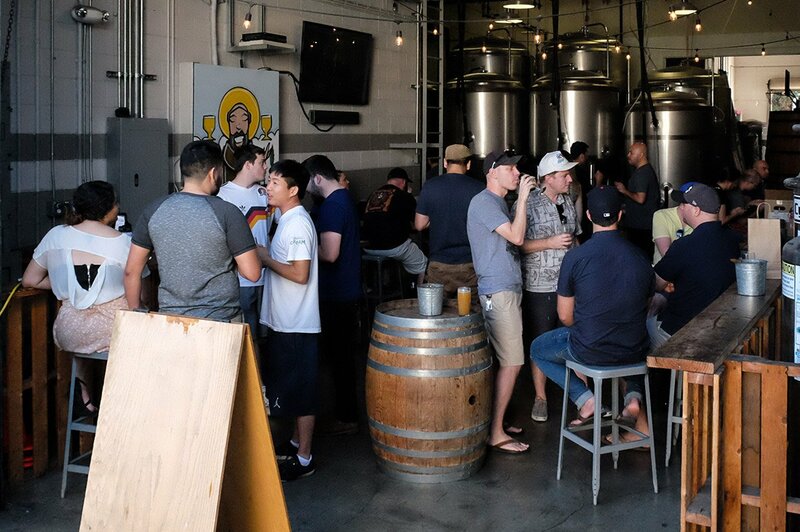 Final thoughts: Good vibe in the tap room and great variety of beer. Also, standing in line for a short-run release is definitely in my future. 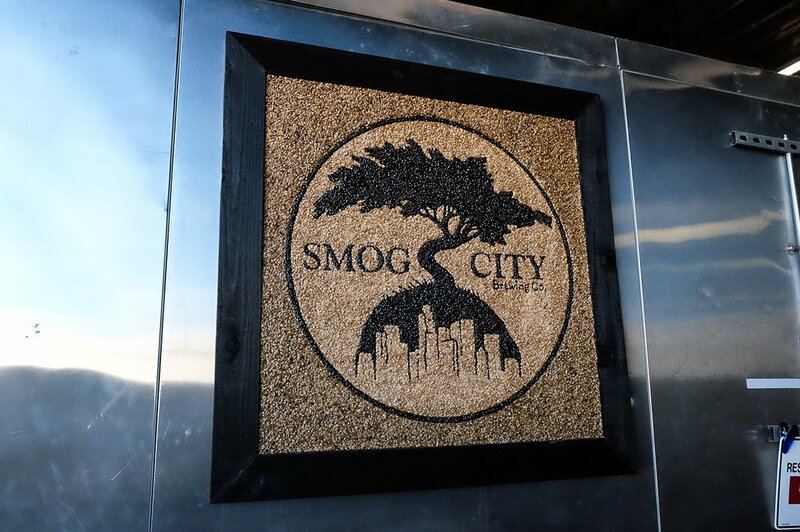 Like Monkish, the last time I visited the Smog City Brewing tap room was just over a year ago. 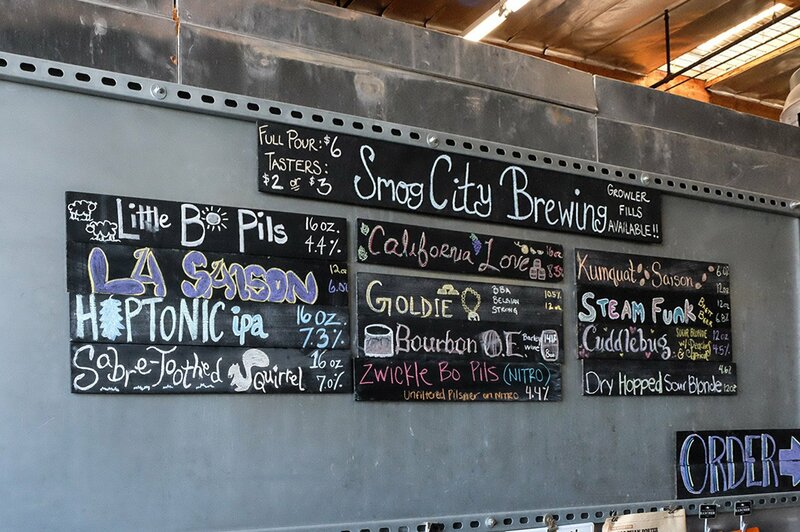 Founded in 2013, Smog City bill themselves as ‘Creatively Inspired and Exceptionally Balanced Beers’. 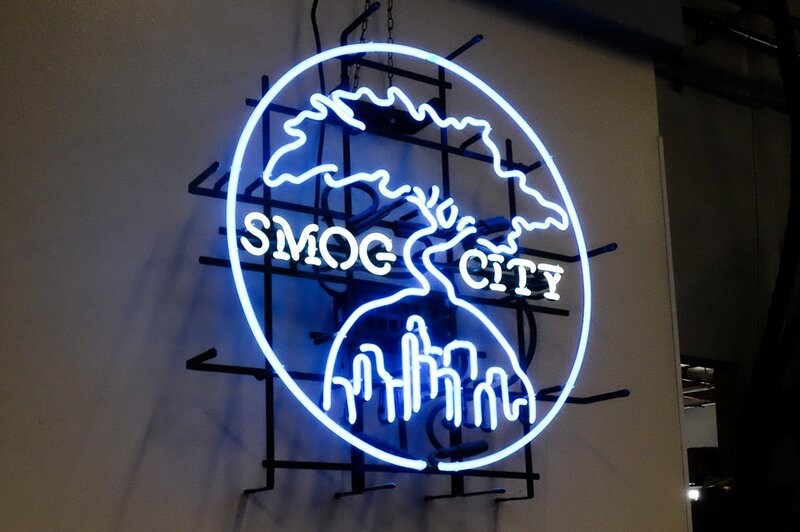 I often go beer shopping and Smog City is always among the local craft beer selections. ‘Amarilla Gorilla IPA’, ‘Sabre-Toothed Squirrel’ Red Ale and ‘Unity’ Tart Saison are the beers I have seen most often. 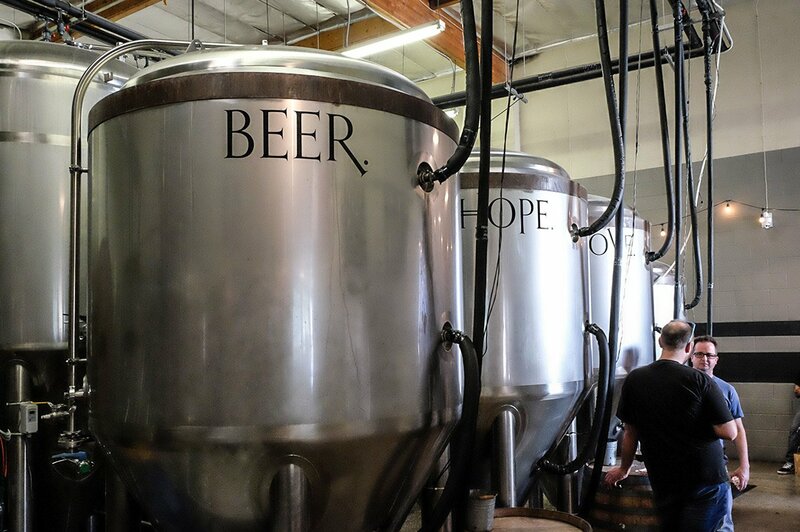 One of my favorite things to do is buy beers that I have not tried before at the brewery they were made. 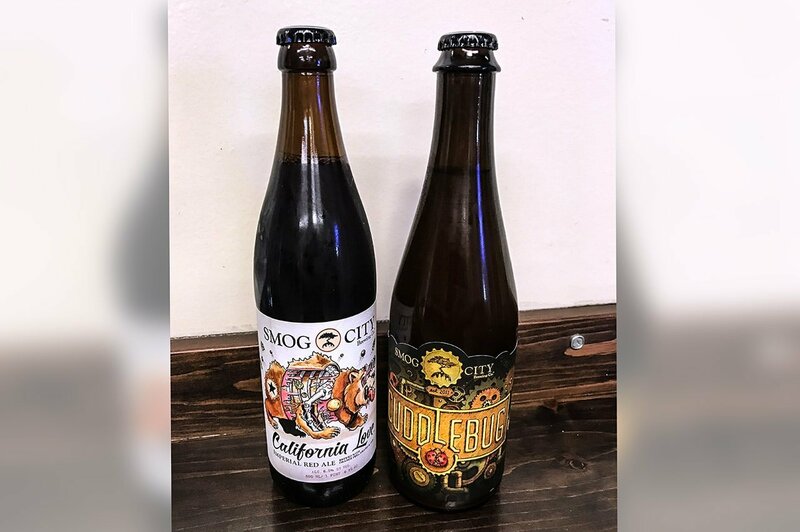 I am excited to have picked up a bottle of ‘California Love’ (Red Ale – Imperial / Double) and a ‘Cuddlebug’ (Sour – Ale) for my girlfriend who loves the sour beers. 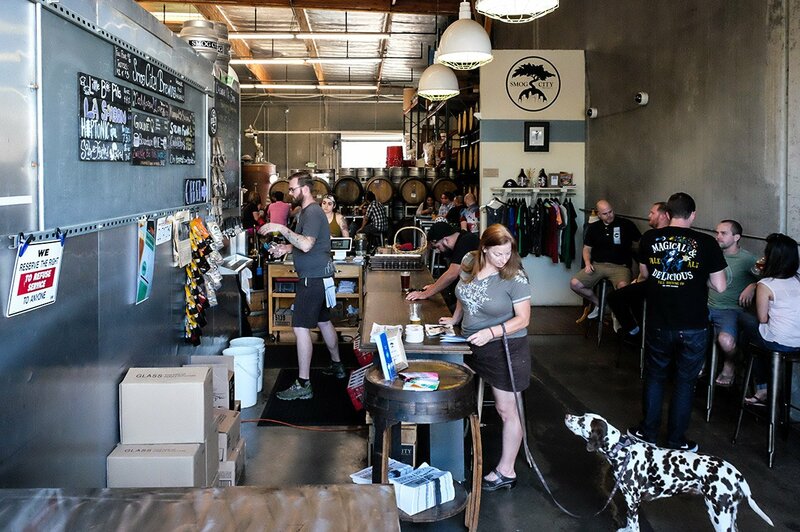 Final thoughts: Nothing has changed in a year, as Smog City is still a super friendly place to grab a very well crafted beer. Really good selection and I highly recommend stopping by. 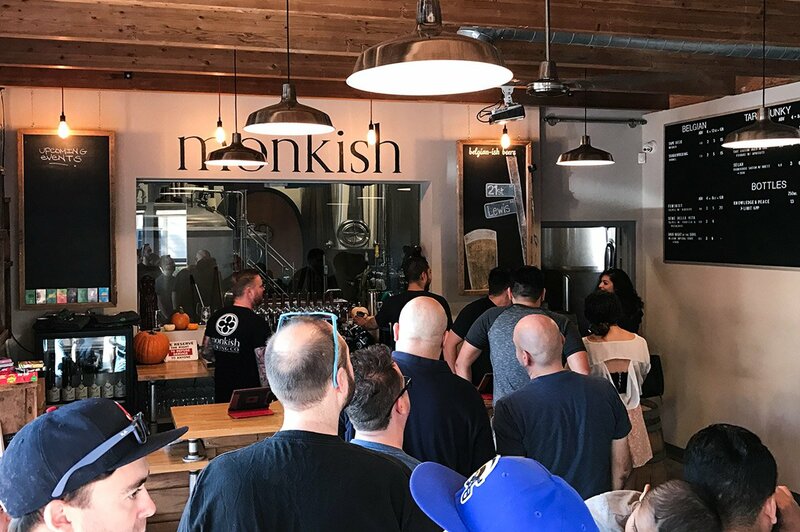 As I was looking in this area I noticed that there was another brewery in between Monkish and Smog City. 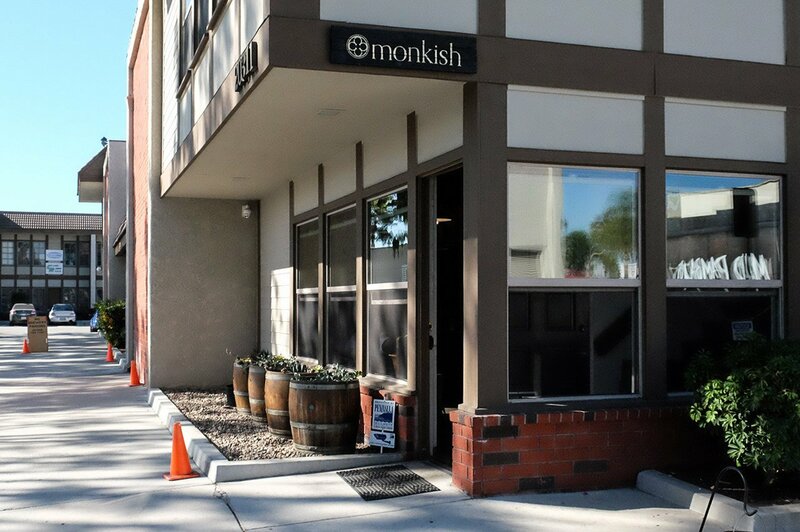 It was almost as if it was a mistake on the map as it was in the same complex that Monkish was in. Of course, and investigation was in order. 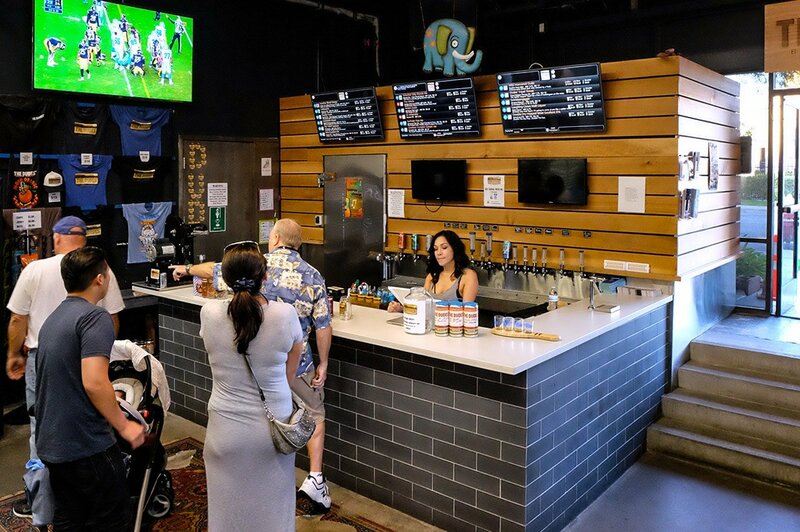 Walking into Cosmic Brewery you can tell there is a different vibe than their brewing neighbors. The motif is space themed with many high powered telescopes on site. Being a new brewery the selection of beer on-site (at this time) is only four. 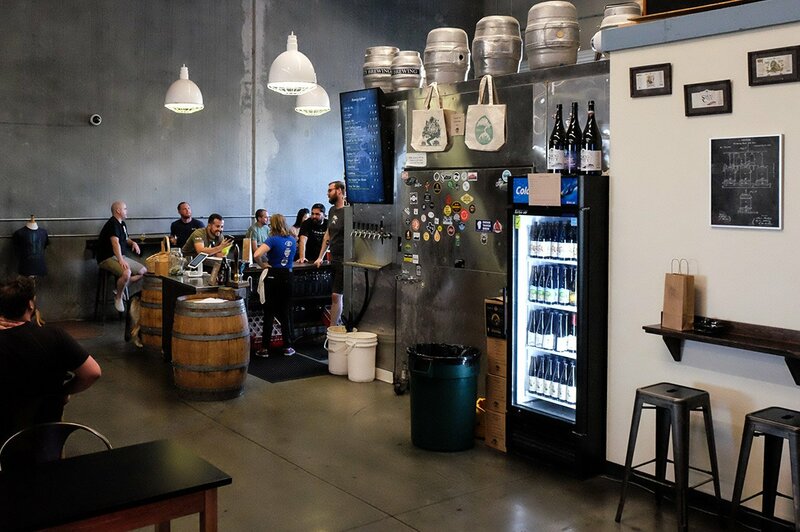 But Cosmic is doing something that could be a growing trend soon in craft beer tasting rooms. They use a Pour My Beer self serving system that uses a card with a pre-paid balance. 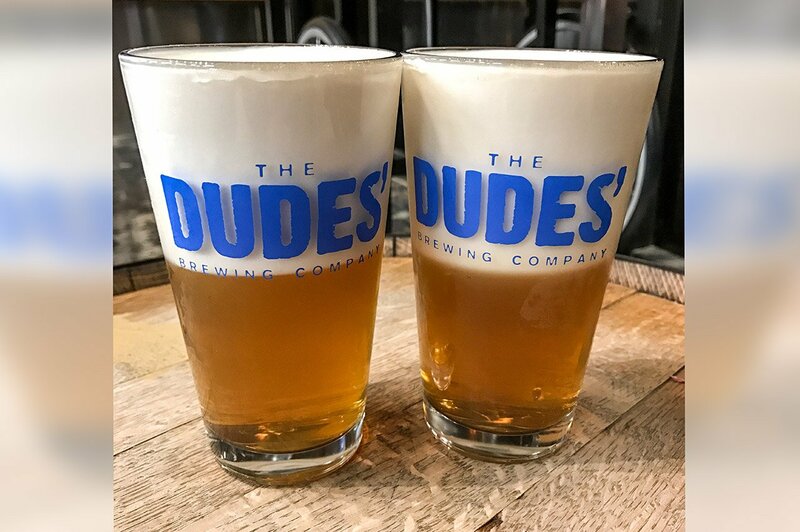 Patrons can use the card and pour their own precise amount of beer at a perfect and consistent cold temperature. 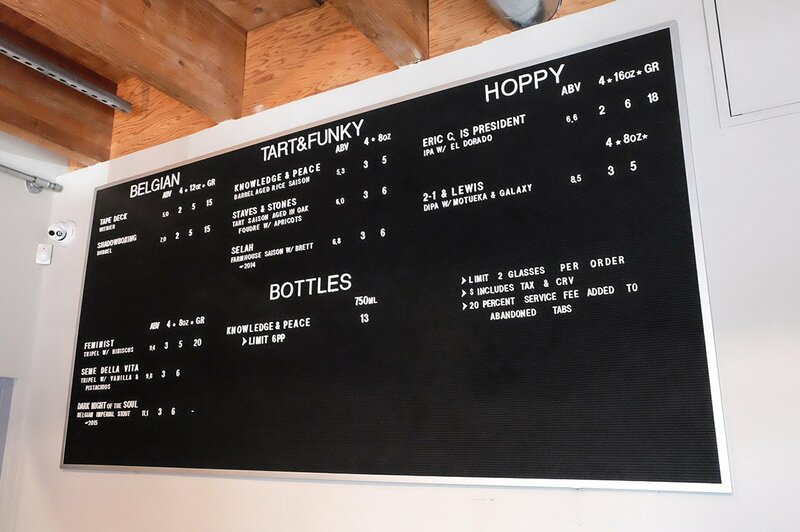 I have seen this in the wine tasting rooms and creates a nice no-waiting beer tasting experience. Final thoughts: Staff was very nice and inviting. Since they didn’t have any bottles available for purchase, I didn’t buy anything. 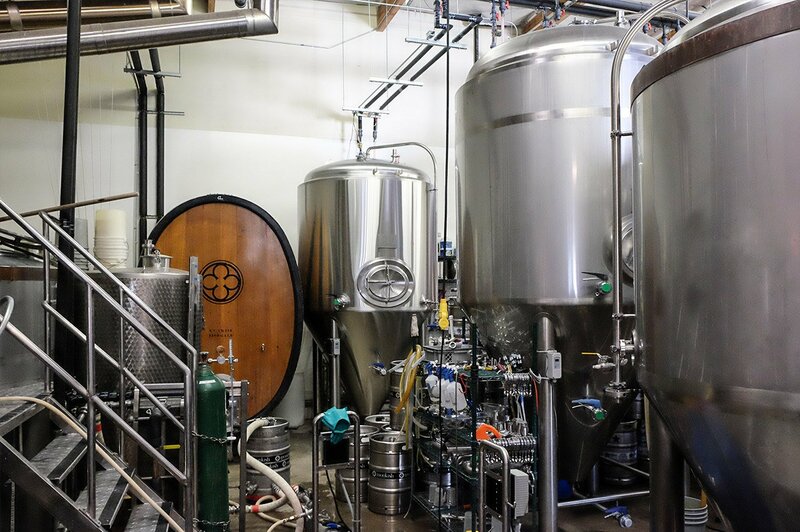 I look forward to trying the self pouring system and sampling the Cosmic line of beer in the future. 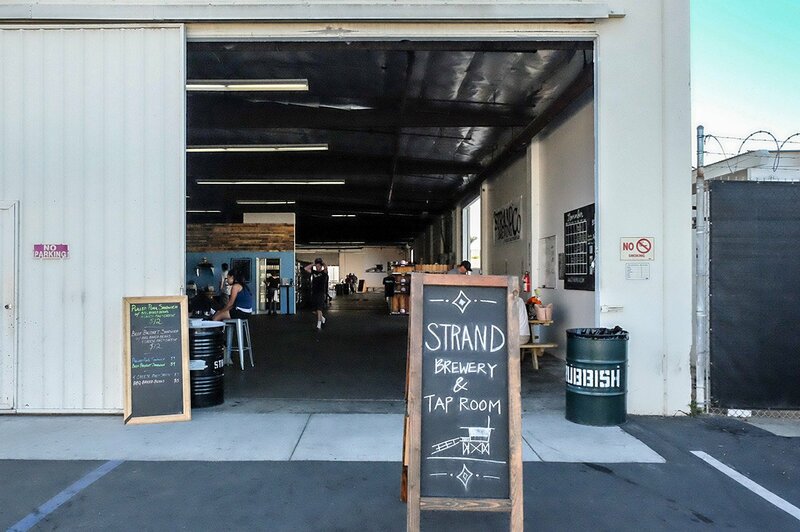 I have a special place in my heart for Strand Brewing Co., as when I was first exploring breweries in Los Angeles they were one of my first discoveries. At that time they had just moved into a huge building. A building so huge that they only filled up a quarter of it. 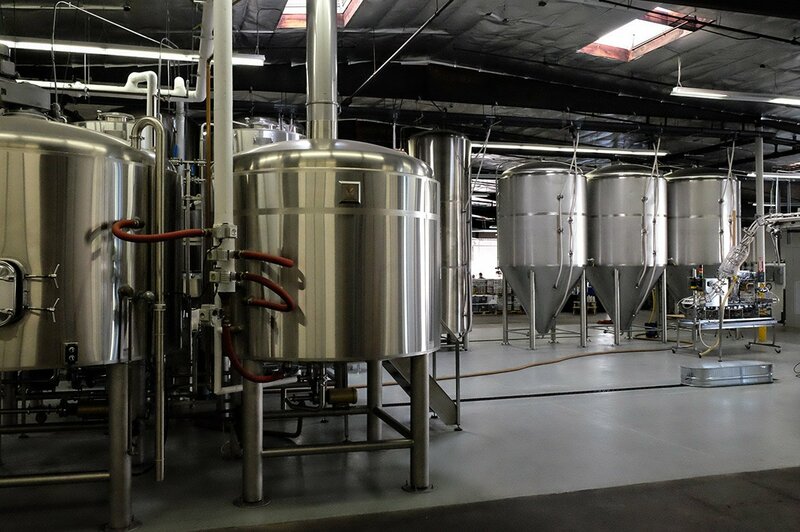 Which in the ever expanding world of craft beer breweries is incredible to have more space than they needed. Now returning years later the facility was actually full… of people. 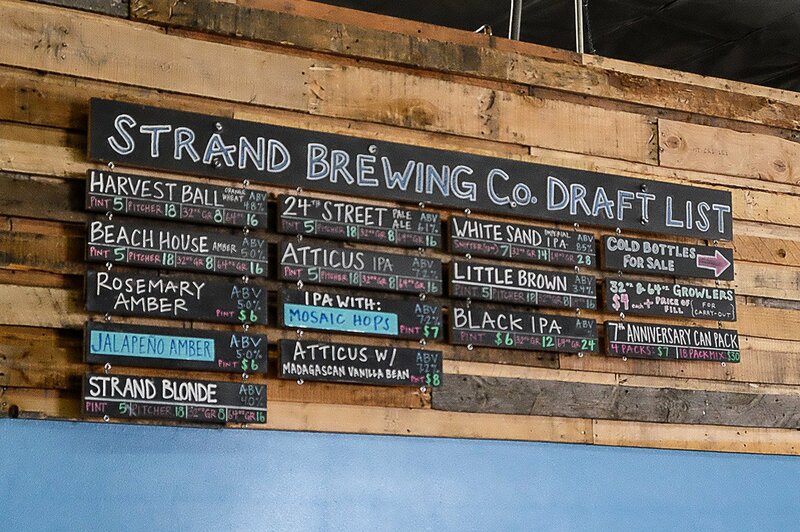 On this weekend Strand was celebrating their 7th year anniversary. 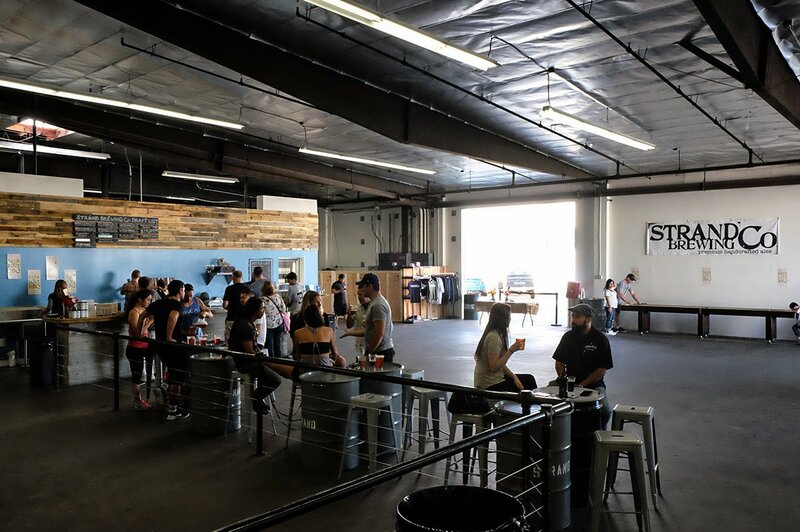 Complete with live music and food inside the facility, patrons enjoyed a wide selection of beer that leans towards single and double IPAs and ales. Because I was waiting to do all my sampling on my last stop, I bought a bottles of ‘Black Sand Imperial IPA’ and ‘Atticus India Pale Ale’ to go. 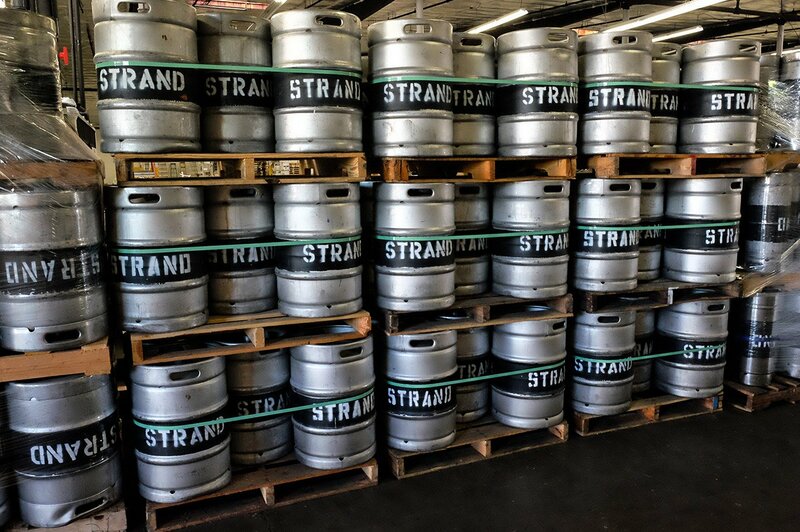 Final thoughts: Because I huge IPA fan, Strand always hits the spot. 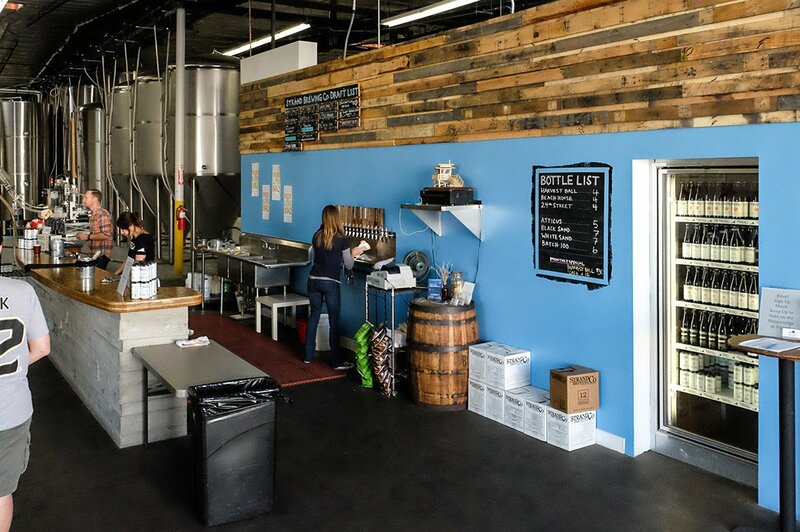 The tasting room is always clean, wide open and has positive energy. 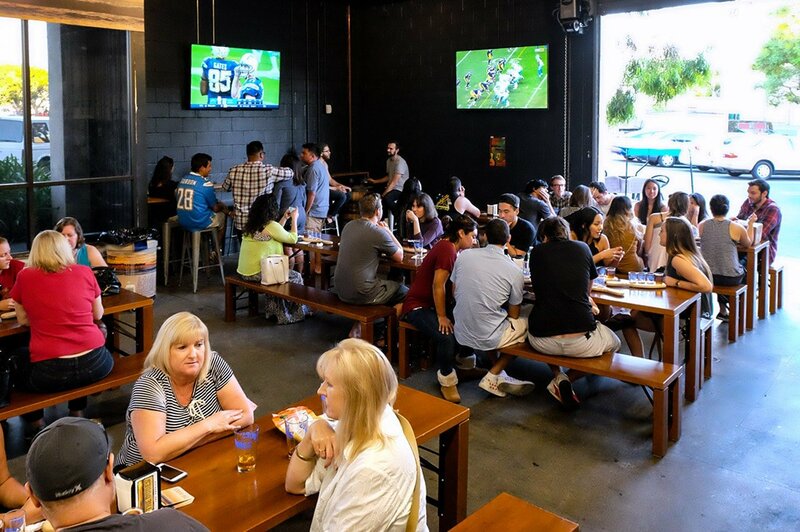 This is the kind of place I could see having a large gathering but also having a few brews with a small amount of people. I look forward to returning soon. 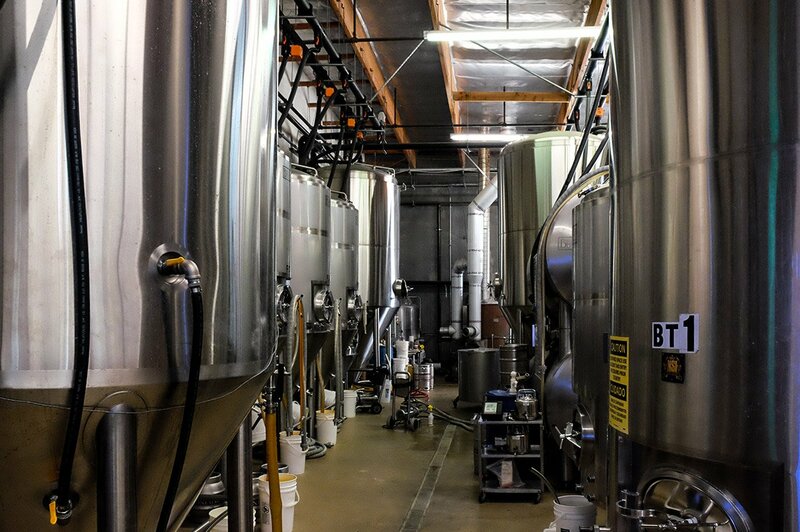 At the risk of giving out my trade secrets, here is why I waited to sample beer at the 5th and last brewery I visited today. 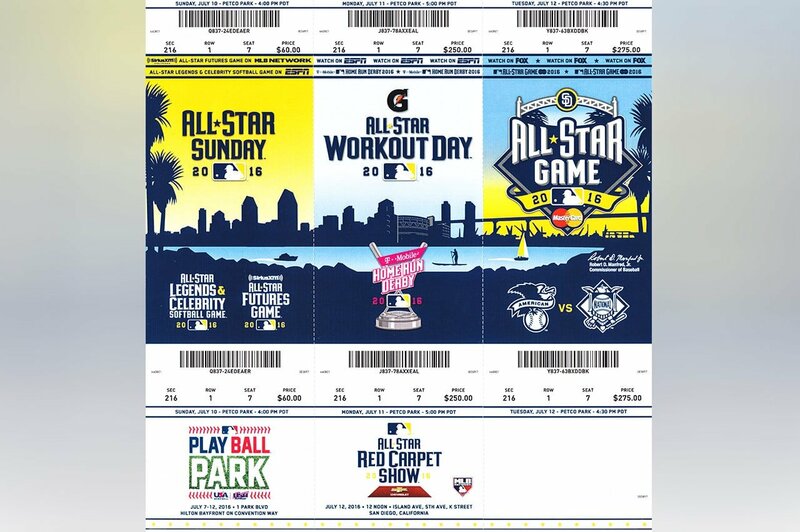 Both me and my Beer Baseball Blog field correspondent Kevin had Groupon purchases for The Dudes’ Brewing Company that were expiring this month. So we doubled up on them and it was glorious. 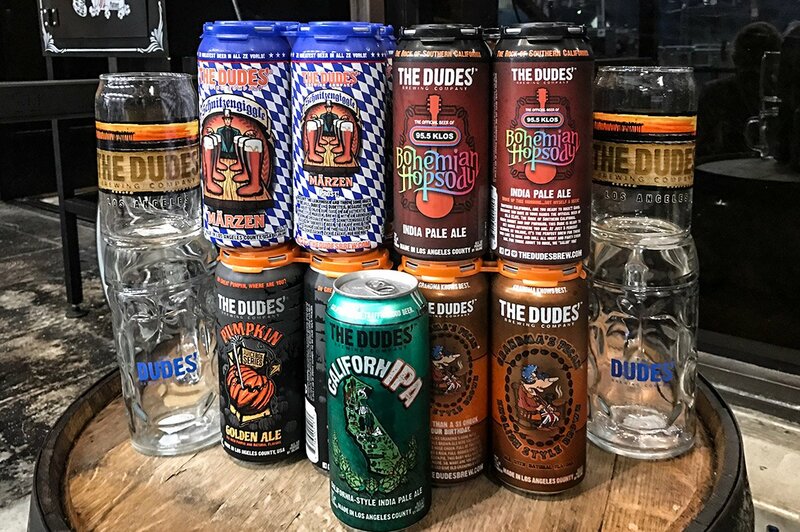 Not only did we have two beer tastings for two, we also walked out with 18 total cans of beer and branded glassware. We felt like gluttons but it was pretty amazing at the same time. 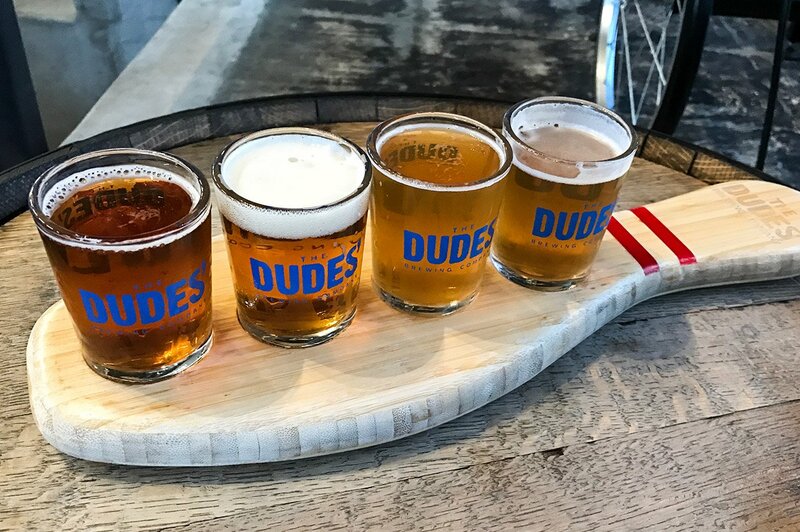 Dudes Brewing started in 2013 and is based on the movie The Big Lebowski, complete with bowling pin shaped taster holders. 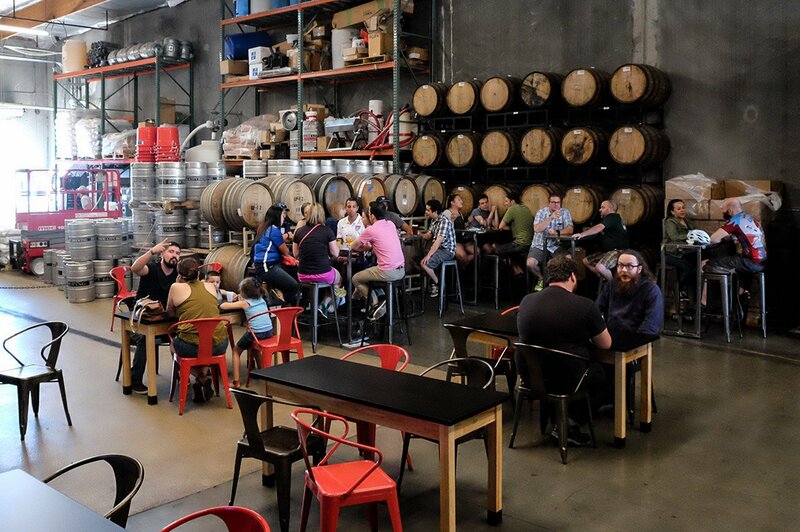 The tasting room is only open 4 days a week (Thursday and Friday 3:00 p.m. – 10:00 p.m. and Saturday and Sunday 12:00 p.m. – 10:00 p.m.). 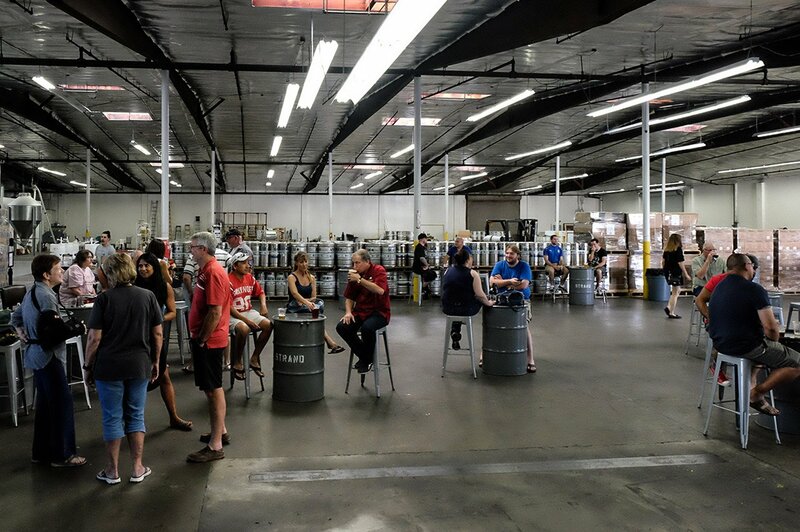 In addition to the Torrance location, there is a second location that opened this summer in Thousand Oaks, CA. Final thoughts: Great stuff as always. My favorite Dudes beer was the ’CalifornIPA’. While I am not a huge fan of the flavored beers I really enjoyed the ‘Pumpkin Golden Ale’ and ’Grandma’s Pecan’. Also, we tried the ‘OJ Milkshake’ and it was definitely the surprise of the night with it’s Nitro-esque complexity. 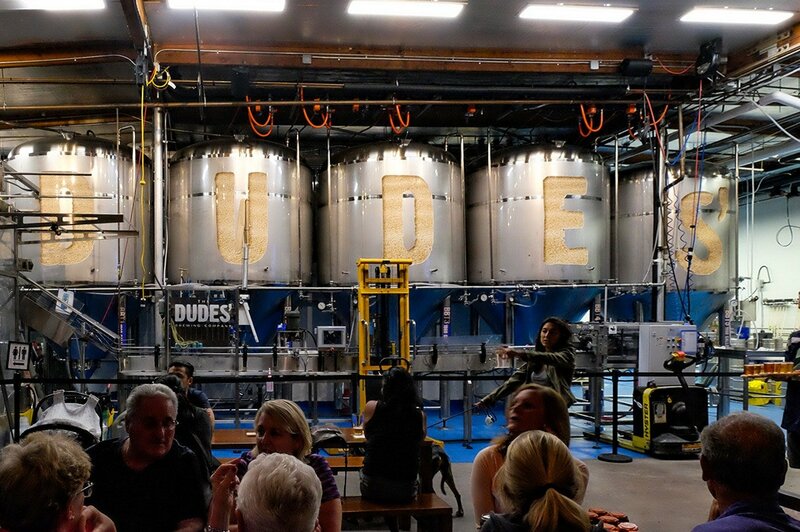 The Dude abides.